I use the word “enthusiastic” pretty regularly to describe the people I write about for InFocus Magazine. But after eight years and dozens of articles, only now, thanks to this issue’s interview subject Shari Dunnet, do I know the deeper meaning of this word. “Enthusiasm, if you look at its etymology, means to be infused with spirit,” says Dunnet, speaking, well, with enthusiasm. The word derives from the Greek entheos—“en” meaning filled, “theos” meaning God or spirit. Dunnet is using this word to describe her feelings about the launch of her and partner Richard Menard’s new Bio-Energy Healing practice, which operates in two locations in the Comox Valley: their Denman Island home-based clinic and Comox Valley Chiropractics Centre (formerly Ocean Health Centre) in Downtown Courtenay. “Filled with spirit” is an apt phrase to describe the work Dunnet and Menard do. “Spirit” also means “energy” or “life force,” and this healing modality works directly with the way our energy—our life force—moves in our body. At the core of Bio-Energy Healing is the concept of the human biofield. This term refers to the electro-magnetic energy system that surrounds and permeates every living organism. Essentially, the biofield is the structural network of energies and information that underlies cellular function. Because the biofield is highly integrated with the physical body, the mental/emotional systems, and the spiritual being of the individual, it is both affected by and can affect health on all these levels. Therapeutic approaches that work with the biofield are often referred to, collectively, as energy healing, and include techniques such as Reiki, Cranial-Sacral Therapy, homoeopathy, Touch for Health, sound healing and practices such as yoga, Tai Chi and Chi Kung. But the biofield concept doesn’t just belong to “alternative medicine” realms. Mainstream diagnostic tools such as the electrocardiogram, magnetic resonance imaging and the electroencephalogram work with the biofield, and a cardiac pacemaker introduces an electro-magnetic field that restores normal heart rhythms. The biofield is the subject of study, measurement and discussion around the world. The US National Institutes of Health recognized its significance in 2004, and it is now referenced in a number of research papers accessible through PubMed, according to the Centre for Biofield Sciences in India. In 1964, the invention of the superconducting quantum interference device (known as the SQUID), an extremely sensitive magnetometer, by scientists at Ford Research Lab in the United States, created the ability to measure the biomagnetic field produced by a single heartbeat, muscle twitch or pattern of neural activity in the brain. These instruments are now being used to map the dynamic energy fields around the body. Although Western science has just recently been able to measure and make use of the biofield, there is plenty of evidence that humans have practised energy healing for millennia. For example, as early as 2750 BC, sick people used the shocks produced by electric eels for healing. And there is evidence that the ancients in Africa, Egypt and China practised forms for magnetic healing using minerals such as magnetite. Although this is interesting stuff, Dunnet and Menard stress that their clients don’t need to have any knowledge of, or even interest in, the theory behind what they do. “You don’t even have to believe in it—you just have to be open,” says Menard. A tall, lanky man with a short beard, brown hair tied back in a ponytail, and a steady gaze, he exudes calm—a fitting counterpart to Dunnet, whose corkscrew red curls and dancing blue eyes suggest energy and engagement. “This is an incredibly safe technique, which I think makes it feel accessible to many people,” adds Dunnet. Bioenergy healing can be effective for just about any specific condition, including pain, stress, anxiety and depression, insomnia, arthritis, low energy, migraines, IBS, addictions, allergies and more. It can also help with general well-being and personal development goals such as tapping into creativity, becoming emotionally resilient, or enhancing spiritual growth. To fully understand what they do, I sign up for a session with Menard at his and Dunnet’s Denman Island home-based clinic—arguably the perfect setting for a healing experience. The wood and glass house sits on a waterfront acreage with a panoramic view of Baynes Sound and the snow-dusted mountains. An eagle circles overhead, and the damp smell of a West Coast spring permeates the air. The session starts with a brief questionnaire covering my health history and goals for the session. I need to think a minute or two about my goal. Luckily, I do not have a health challenge. But I realize I do have a problem—the past few months I’ve been distracted, forgetful, absent-minded, and tired. Something is pulling at my energy. This is not the sort of thing I’d consider bringing to a doctor, but I share it with Menard, who nods in understanding. Setting my intention as “becoming more present and focused,” we begin. I stand in the middle of the room, looking out the window toward balsam, cedar and Douglas firs. After a few minutes my eyes naturally close, and I keep them that way, just peeking now and then as my journalistic duty. The next 45 minutes could be described as extremely uneventful—or full of action, depending on the perspective. From the outside, you would see Menard making a variety of hand motions around my body, a few inches from the surface—scanning, spiralling, pulling away. From the inside, I experience a panoply of sensations: heaviness, then later lightness, tingling in my forehead, my solar plexus, and the centre of my chest, pressure in my skull, then release. Sometimes there is no sensation and I feel bored—just a woman standing in a room with a long-haired dude waving his hands around her body. Then a sigh comes up from the bottoms of my lungs and I feel the skin all over my body relax, like a shell cracking off. When it’s over, I feel great. Perhaps, I think, just standing and doing nothing for 45 minutes is therapeutic enough—an island of stillness in the swirl of my life. Over the next few days, I do indeed feel more present and focused, and spend far less time muttering to myself, “Now where did I put the…. ?” and “What did I come upstairs for?” And—even better—I feel like I’m able to give my attention more fully to my children, my husband, and my work. This initial session will be the first of a series of five, which is how Menard and Dunnet usually work, although they are not averse to doing just a single session if a client wants. For most people, at the end of a five-session series, the process is complete. Menard explains how it works. “My intention is to pull blocked energy out of the energy field and the body where there’s congestion,” he says. “This then creates a vacuum. The energy trapped deep in the body comes to fill this vacancy. Then the next session gets to that deeper level.” Mostly the sessions are quiet, but sometimes the practitioner asks questions or engages in dialogue aimed at nudging the client to step away from old, limiting thought patterns. Dunnet adds: “…or let them go.” Bio-Energy Healing can help create deep energy shifts that allow this to happen. Long-term issues that have resisted other types of treatment can resolve, she says. “I had someone who had been living with severe chronic anxiety for 30 years and it was running her life. I had five sessions with her and it was gone,” says Dunnet. For Dunnet and Menard, becoming Bio-Energy practitioners didn’t so much signify a turnabout in their lives as much as an evolution. Dunnet can pinpoint the moment they literally became enthused. The couple had studied and experienced a wider variety of healing arts, but not as the focus of their working lives. However, their work and lives over the past couple of decades clearly encompassed healing elements. Menard was, and still is, a working artist, whose wood carvings reference Buddhist iconography, West Coast First Nations style, and the natural world. His website uses the tag line, “Art for serenity and healing.” He’d been a seeker of truth, meaning and personal growth his whole adult life, living in solitude in the Clayoquot Sound rainforest for seven years, studying yoga and meditation as a spiritual path, and exploring a variety of healing techniques to overcome childhood trauma. Dunnet had worked in social work, including five years as an AIDS outreach worker, and also had a background in community health care administration, and as an artist, musician and activist. “I’ve been very involved in social justice issues, and have spent a lot of time discussing what constitutes empowerment, and what constitutes disempowerment. Now, as a Bio-Energy Healer, the impetus for what I do is still that commitment to empowerment, but in a whole other dimension,” says Dunnet. To follow up on their epiphany in Hawaii, they signed up for training in Vancouver with Michael D’Alton, who has been practicing and teaching Bio-Energy Healing for more than 20 years. 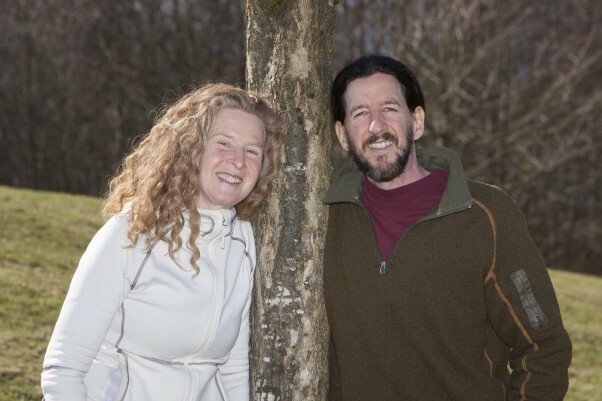 Originally from Ireland, D’Alton studied with Plexus Bio-Energy and in 2005 founded his own International School of Bio-Energy Healing in Canada. Dunnet and Menard are the only certified Bio-Energy Healing practitioners in the North Island region. They plan further studies with D’Alton, are also doing course work in another healing modality called Soul Integration Technology, and their practice on both Denman and in Courtenay has taken off. “We are doing our purpose work,” says Menard. And when action is aligned with purpose, energy flows. The enthusiasm that was kindled in Hawaii is deepened by every healing session they offer. Dunnet explains why she finds her work rewarding: “It’s co-creation. We are working with universal energy and life force, and it is miraculous. It allows you to be part of life in a different way. Energy healers depend on both innate ability and training, say Menard and Dunnet. “Technique plays a role, definitely. There is a body of knowledge behind what we do,” says Menard. At the same time, they both feel they always had a natural aptitude, a certain awareness they were born with. In the meantime, Dunnet and Menard are using their skills to facilitate quantum leaps in health and energy for each of their clients. “We are here to help raise the frequency,” says Menard. “And to alleviate suffering,” adds Dunnet. I use the word “enthusiastic” pretty regularly to describe the people I write about for InFocus Magazine. But after eight years and dozens of articles, tadalafil only now, thanks to this issue’s interview subject Shari Dunnet, do I know the deeper meaning of this word. It is 8:00 pm on a Tuesday night when I sit down with Dr. Peter Parke at the Tsolum Mobile Veterinary Health Clinic, on the Old Island Highway north of Courtenay. I would have enjoyed asking Parke about his life as a large animal veterinarian who treats cattle, horses, sheep, hogs and a myriad of other barnyard creatures, but I am not there to ‘talk shop.’ Not only is that not my assignment, I am genuinely intrigued to find out why he would dedicate so much of his free time volunteering to work with young athletes. “A typical weekday starts around 8:00 am—provided I haven’t been called to an emergency,” explains Parke. “I do farm visits and paperwork, monitor what’s happening with my small animal practice, then wrap up my duties as a veterinarian in the early afternoon. Then I head over to G.P. Vanier Secondary School or the nearby Sports Centre where I coach junior and senior boys rugby, junior girls basketball, Comox Valley midget lacrosse or the Comox Valley intermediate lacrosse. I also coach or manage regional and provincial basketball, rugby and lacrosse teams. Parke, 50, explains all of this rather nonchalantly, as if this is a typical day for most people. I am exhausted just listening to him! “No, I don’t have kids in the school system,” he replies when asked why he volunteers so much. “I don’t have any kids at all. I do this simply because I absolutely loved playing sports while I was in school and I want to ensure that other kids get to enjoy some of the same opportunities that I did. Parke grew up on a dairy farm in Richmond, BC, where he helped his family care for a herd of 60 to 100 Guernsey cattle and an assortment of goats, chickens, dogs and cats. It was here that he developed an appreciation for hard work and a keen interest in animal sciences. But farm life wasn’t all work and no play for the Parke kids—especially for young Peter. His father loved sports and he made sure that his children did too. Peter played basketball, lacrosse, rugby and ball hockey. He played for the Vancouver Burrards and the New Westminster Salmonbellies Men’s Senior ‘A’ lacrosse team in the Western Lacrosse Association. After graduating from high school, Parke earned a Bachelor of Science in Agriculture from UBC in 1987. That same year, the Parke family sold their farm, leaving Peter without a place to work. For the next few years he worked as a dairy farm laborer in the lower mainland. In 1990, he moved to Ontario to play senior lacrosse with the Brooklin Redmen Lacrosse Club, while completing a Masters in Animal Breeding at the University of Guelph. He graduated in 1995 and was accepted into vet school, where he focused on dairy medicine and surgery. He graduated as a Doctor of Veterinary Medicine in 2000. During his studies he worked dairy rotations at Cornell and Kansas State Universities and attended a number of North American veterinary conferences. All that time he continued to play rugby at the University of Guelph, as well as pro lacrosse in Detroit, Rochester and Buffalo. A move to the Comox Valley was facilitated in 2003, when Dr. Pat O’Brien was looking to retire and sell his well-established large animal practice here. At the time, Tsolum Mobile Veterinary Health operated out of a farm on Nelson Road. O’Brien contacted Parke about buying the clinic and, as the saying goes, the rest is history. In the summer of 2013, the clinic moved to its present location on the Old Island Highway by the Merville General Store and, with the hiring of Dr. Alecia Ducharme, Parke expanded to be a mixed animal practice. Despite the challenges of running a then new (to him) veterinary practice, like a true sportsman Parke hit the proverbial ground running. In addition to his work as a vet, he began networking to connect himself with various sports teams, offering his services as a volunteer coach. It wasn’t long before his skills and experience were recognized and several local teams welcomed him. In the 10-plus years he has coached local athletes, Parke estimates that he has worked with more than 1,000 boys and girls aged 14 to 17. Many of them have gone on to bigger and better things well beyond the Comox Valley. Many have gone on to play club, college or university athletics. Some have completed their degrees with sports scholarships. All have been inspired by Parke’s infectious team spirit and energy. When asked if any of the kids he has coached particularly stand out, Parke becomes as animated as any proud parent. “Max Maund went on to be a star player in soccer, track and field and rugby for St. Francis Xavier University in Nova Scotia,” he says. “Thyssen deGoede plays on Canada’s national senior rugby team. Adam Backular-Evans is now a dedicated senior athlete and pro lacrosse hopeful in the USA. “But not all the kids go on to excel in sports. Simon Nessman was one of my rugby players. He is now one of the top male models in the world and is the face of Giorgio Armani. These are just a few examples—there are many, many others that I am equally as proud of,” he says. Parke decided to create a program that would connect local businesses with the sports community to ensure that insufficient funding would no longer stand in the way of any students who want to play high school team sports. In January 2013, with the support of fellow sports enthusiasts and business leaders, he established the Comox Valley Athletic Association (CVAA). A Board of Directors that consists of Parke, as President and Treasurer, as well as Ken Erikson, Dwayne Mills, Heidi Zirkl and John Lewis as Directors, governs this registered non-profit organization. It is modeled after a similar and very successful program that operates out of the Cowichan Valley. In its first year of operation the CVAA managed to secure both financial and ‘gifts in kind’ support from a number of local businesses and organizations. This includes contributions from several BNI Olympic Gold members: Jiffy Lube, Hollis Wealth Management, Sure Copy, Woofy’s Pet Food, Arrow Art Screen Printing, Ronnie Lister of Re/Max Ocean Pacific Realty, Dale Roberts Notary Pubic, and the Prime Chophouse, to name just a few. For anyone interested in adding their name to the list of supporters, the CVAA welcomes your call. There are plenty of opportunities to help such as having advertising space on the CVAA bus for $500 per year, donating tires, mechanical repairs, door prize donations for upcoming events and, of course, cash contributions. They are grateful for any support. In addition to subsidizing travel, training and equipment, monies raised by the Association has facilitated the purchase of a 24-passenger bus that is used to transport teams to tournaments, athletic training and other events. It is primarily used by the CVAA but is available for other teams to rent. Parke hopes to buy a second bus in the near future. It is important to note that the CVAA also welcomes a ‘hand up’ and the team members are willing to work. The athletes participate in various fundraising activities throughout the year, such as helping with the set-up and tear-down at the fall fair, moving hay bales at Therapeutic Riding, assisting with parking at special events, hot dog sales, packing groceries and more. Parke is adamant that getting the kids involved in fundraising through community events teaches them to be responsible for part of their participation costs. Each time they help at an event, they are credited a dollar amount in their own individual accounts. There is also a general fund, with money allocated for such things as athletic training, team dinners, bus maintenance and expenses, and (hopefully) a future annual scholarship. With the support of the various schools’ Parent Advisory Committees (PAC) and sports program funding, as well as the CVAA and parent fundraising, Parke is able to take local teams on major trips. In mid-March, for example, he and school coach Ken Erikson travelled to the United Kingdom with 12 young men from the G.P. Vanier Senior Boys Rugby Team. Local athletes included Dylan Coburn, Blair Schmelz, Brandon Grouchy-Johnston, Trevor Caton, Callum Passingham, Bradly Doig, Justin Thomson, Foster Dewitt, Jimmy Brazier, Joshua Illerbrun, Arne Neumann and Sean McGinnis. A highlight of the trip was being at Millennium Stadium in Cardiff, Wales on March 15 to watch world-class rugby action as Wales thrashed Scotland 51 to 3 in their biggest ever Six Nation win. They also had the opportunity to visit Rugby, Warwickshire, England—the birthplace of the sport—as well as tour London and play in seven-a-side rugby tournaments in Cardiff and Llanelli, Wales plus Richmond, Halifax, Bryanston, England. Nine out of the 11 nights they were billeted with local families, further adding to the cultural experience. Mike Caton’s son, Trevor, was one of the players who had earned a spot on the team that travelled to England and he is proud of what the team, under Parke’s direction, has achieved. “Peter Parke is an amazing man,” says Caton. “He has been coaching Trevor for a few years now and, as I have had the privilege of getting to know him over that time, I have learned that he is very passionate and dedicated to his ‘job’ as a volunteer coach. He has played professional sports but he is pretty humble about this. He is always preaching to the kids about effort and being part of a team, being accountable and giving it your all. These are skills that they can carry forward in their lives. Playing sports, winning and yes, sometimes losing, believes Parke, becomes a metaphor for life.